There was five of us, five days, and six restaurants. Everyday a different place, everyday new surprises. I’m refering to the dim sum extravagant that I took part courtesy of Cuisine & Wine Asia magazine. For their may/june edition, there’s this dim sum special feature, and five of the food bloggers including myself went for the tasting. I made it for four out of six places, even though we had dim sum everyday for a week – I still love my dim sum! The magazine is now out in stores, so as cliché as it sounds, grab a copy now! Right, I’ll be posting the series of 4 posts namely on Wan Hao Chinese restaurant, Si Chuan Dou Hua restaurant, Cherry Garden, and Man Fu Yuan restaurant for this coming week. It was crazy, really. We tried more than a hundred dishes over the few days and it was not it; imagine the frenzy photo-taking among the few of us! We ate, snapped photos, and ate some more. We even tried two restaurants in a day for Si Chuan Dou Hua and Cherry Garden; after finishing at the former, we went straight to the latter to continue round two! But it was very fun to meet up with the other food bloggers to appreciate the exquisite dim sum, and I really enjoyed myself for the few days. My appreciation to Jackson, featured writer for C&W who invited me for the tasting, to the hosts from the various restaurants, and my fellow food bloggers who had made the session enjoyable. And now, let the mad-fast-and-fury dim sum blow you away! take a snap shot of the content? Wah you got your copy already? Mine haven’t arrive yet! Camemberus last blog post..Eight Treasures Tea ??? What a great job you have! Must be the envy of many glutton souls out there! Congrates on being featured in the magazine. It is really amazing, indulging in dim sum for that few days. 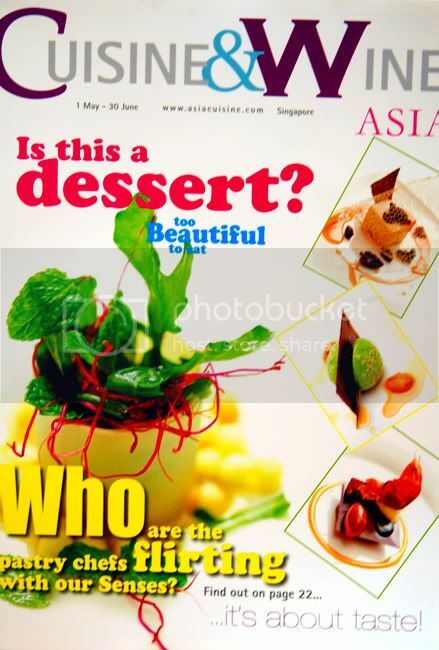 Hi… Can you tell me where the cuisine and wine asia magazine can be bought?